Today’s adults may frown upon the lyrics of this song as childish naiveté; a product of wishful thinking. Pure motivation and optimism is not going to get you anyway. The harsh truth is that sometimes the “Thomas” trains in this world would never be able to reach the peak even though they often convince themselves with the optimistic mantra, “Yes, I can. Yes, I can!” The president of one of the most powerful countries of the world, facing one of its worst economic crises, exposed the myth of this tagline, though it caught the imagination of his voters. Seven years after his entry into the first term of presidency and then into a second term, his track record provides irrefutable evidence that sometimes, despite an optimistic outlook on life, you just CAN’T! 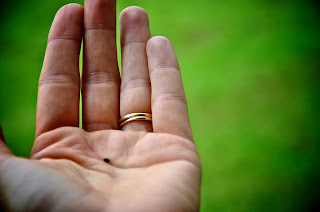 To the undiscerning, the idea of mustard seed faith moving mountains does sound a lot like ants chopping down rubber trees and rams singlehandedly destroying billion kilowatt dams. But the message of today’s parables must not be confused with false promises of positive thinking. The point of agreement is that greatness can often stem from small things. But this is where similarities come to an end. The hope and foundation of faith expounded by these stories have a basis in reality, in the person of Jesus Christ, his message, in the small band of followers and the Church that grew out of Pentecost. The last stands as testimony to the truth of what he had proclaimed. Just in case our detractors were to accuse us of similar flights of fancy, we affirm that our faith, our hope, in Jesus Christ is not based on wishful thinking. It is not a psychological crutch to get us by difficult times. Rather it rests firmly on the promises of God and his Christ. And why should we believe God and Jesus? Well, unlike other famous dignitaries of our times, God has a proven track record. Jesus’ audience was also waiting for some hopeful sign that he would bring about the liberation of Israel expediently in a big and dramatic way. They were soon disappointed. When reproached about the seeming ineffectiveness of his methods and the apparent lack of success of his preaching, Jesus answered the impatience of his followers and listeners with a lesson of trust and hope. It’s not always as it seems. Just as growth of a plant may seem imperceptible to the naked eye, patience would soon be rewarded with an irrefutable evidence of such growth – the harvest and the matured tree. In using the lesson from nature, Jesus begins to explain the reason why he did not resort to a more forceful and efficient way to establish the kingdom of God. Why was so little progress being made, at least based on the observation of others? Why did it take such a long time to accomplish his mission? In the first parable, that of the seed sown secretly at night and then growing into a rich harvest, a distinct contrast is made between the seeming inactivity of the sower and the certainty of the harvest. “Without his knowing,” the seed grows imperceptibly and irrepressibly to ripeness for the harvest. His listeners would have been reminded that the work of God, such as the conversion of souls, moral growth and ethical development, were also imperceptible at first but would become evident in the end. In spite of the imperceptible nature of spiritual growth, in spite of the inertia that seems to impede change, and in spite of the thorns of discouragement and apathy, the growth of the seed, of God’s reign, is assured. Therefore, patience and hope were necessary qualities for those who would become involved in the work of proclaiming the kingdom of God. Despair only comes to those who trust more in their handiwork then in the providence of God. We are reminded in this first parable that the work of God is often unobservable or incomprehensible. Just because we are unable to detect or perceive God working silently in the background, does not mean that he is inactive or insensitive to our plight. We are often tempted to look for major signs and portents, immediate results and easy answers to our questions and prayers. When these are not forthcoming, we descend into frustration and anger, especially directed against God. But Jesus wanted his disciples to know that what is observable on the surface may not be an accurate measure of the final outcome. The story of the seed remind us of the inner dynamism of the Kingdom, a God who is constantly and faithfully at work even when man ceases to work, even when we have chosen to give up, even when everyone else has chosen to abandon this enterprise. In the second and sister parable, that of the mustard seed, the smallness of the seed is contrasted with its end result, a mighty shrub. The Kingdom of God is not flashy; its significance lies in its seeming insignificance. What could have been more insignificant than one gentle man without crown or armies or title or fame? What more a man vilified at the end of his life and one who met the ignoble fate of a criminal, suffering the curse of crucifixion? What could have been less significant than a small group of unsure, unfunded nobodies preaching an unpopular message to an unhearing populace? And yet again, history and the Church today can attests that the seeds of the Kingdom of God planted by Jesus and nourished by his disciples would grow to immeasurable proportions. Impossible, incredible, and yet we are living proof. Today, we are victimised by the concept of bigness. We have been sold the idea and conditioned to believe that “bigger is better.” Within the Church, we have been tempted to believe that “big” counts for everything - our ventures must be preceded by intricate groundwork and planning, massive promotions, big rallies, spectacular shows. The Gospel Story of the Kingdom of God did not begin in such manner. The life of Jesus attests to this. Jesus often spoke of the intrinsic value of small things, like the widow’s mite, the young boy’s five loaves and two fish, the tiny portion of leaven, the humble 1 talent, the single lost coin and lost sheep, and of course, now, the mustard seed. Why “tiny” instead of “big”? Small and humble beginnings place the entire catalyst and mover of the narrative in the hands of God and not in the devices of man. It’s never the story of the ant or the ram or the train who can, but the God who can do all things well, in spite of man’s inability and incapacity. Finally, these two parables teach us that life is essentially eschatological – we were made for heaven! All things will become apparent at the end. The humble beginnings, the awkward and unplanned detours, the obstacles and setbacks, the disappointments and failures, the temporal success and victories do not mark the end of the story. As much as we would want to see immediate and dramatic results, matters of faith are not instantaneous or the results instant. What is definitive are the final fruits of the Kingdom which is not just a wild bet but a factual certainty – the harvest will come and the mustard seed will eventually grow into that large shady tree that will host all the array of the heaven. This eschatological dimension reminds Christians that we must always live in hope despite our present difficulties.